Is there any paperwork or document for the mechanical systems of 35 Chadwick Dr, Ajax, Ontario? I need more information about the property at 35 Chadwick Dr, Ajax, Ontario. How ist the neighborhood, location and nearby amenities for 35 Chadwick Dr, Ajax, Ontario? I have questions about the roof, foundation, insulations and mechanical issues of 35 Chadwick Dr, Ajax, Ontario? I need more information about property details. What's wrong with this house? Is this a short sale? Is there any maintenance for 35 Chadwick Dr, Ajax, Ontario? What is this property worth in today's market? What are "closing costs", and how much? What steps should I take when looking for a home loan? What price home can I afford? Is my credit good enough to buy this house? What are the best mortgage options for me? How flexible is the seller on the asking price? 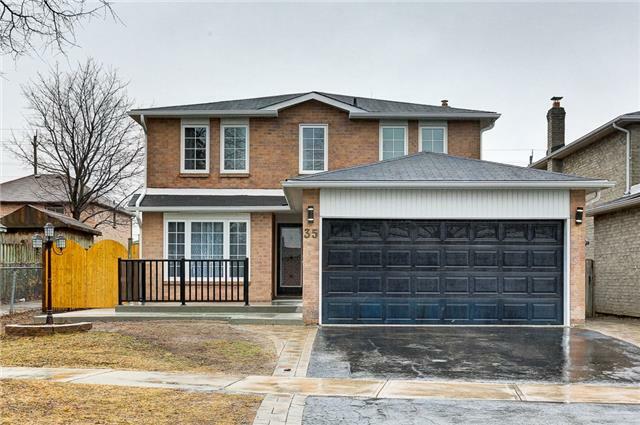 How low can I consider offering for 35 Chadwick Dr, Ajax, Ontario? Absolutely Stunning, Renovated Form Top To Bottom, Flawless Finishes 4 + 2 Bdr 4 + 2 Bathrooms, Modern Concept, Professionally Finished 2 Bdr 2 Baths Basement With Separate Entrance. Potential Income From Basement $1500. Perfect Location Close To Schools, 401, Shopping And Much More. This Home Is Ready To Move In. Modern Kitchen, Backsplash, Pot-Lights, Flooring, Wrought Iron Doors And Stairs. Poured Concrete Front And Back. Extra Rec Room On Upper Floor.